The Files pane may present files and folders using a variety of display methods. Each has its own merit, depending on the content being displayed, and may display different amounts of file information. Views may be also accessible from a button on the Main toolbar. In most views, the name may appear to be the primary display item. Actually, it the leftmost information column (as shown in details view) which is displayed! In icons view, for example, the file size could be displayed instead. See Select Columns… for more information. This view displays thumbnail images for each file. Using Thumbnails is primarily useful when displaying images; other files may simply display a generic image assigned by Windows. Explorer++ presents a view of each folder, as well, showing a few thumbnails of images (if any) contained therein. Currently, the thumbnail size is fixed (internal to Explorer++) at 120x120 pixels. Explorer++ does not cache thumbnails as Windows Explorer does (optionally creates “Thumbs.db” file). 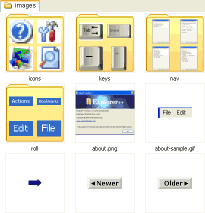 Tiles view displays the files and folders, using the Windows generic images for file types. In addition, the file type and size is displayed. Files and folders are displayed in a manner similar to Thumbnails - in as many columns as the width of the Files pane will allow. Icons view uses embedded (resource) icons from files and, as with Thumbnails and Tiles, displays the files and folders in columns, as space allows. Icons view is perhaps better suited to displaying executable files, and icon files (of course). Icons are displayed in 32x32 bit size. Windows Vista / 7 presents 4 different sized icons for View choices. The Small Icons view is similar to Icons view, but the icons are displayed in 16x16 bit size allowing more files/folders to be displayed in the same space. The Small Icons view currently has some acknowledged deficiencies in layout behavior. List view displays files using generic icons and a single piece of information, usually the file name (see above). Items are displayed in columns to fit the available space. The Details view shows textual information and generic icons, in a single vertical list. It can display multiple columns of information, as set by the user. This display method can yield the most information, but usually takes up the most pane width. Columns not displayed due to lack of pane width may be scrolled into view as needed. Items displayed in this view may be re-arranged using drag-and-drop. This has no effect on their actual order in the folder, but may aid the user in selections, editing, etc.